Want plans for this project? Get them at the Plan Store. Learn to build RC model boats the easy and inexpensive way. These projects are perfect for beginners and those looking for a cheap, easy, simple and fast build. These RC model boats are based on an easy-to-build 15-inch long hard chine hull mostly constructed from balsa. These boats would make great introductions to both scratch building and RC boating. You may wonder why I keep referring to this project in plural. The reason is, this hull will become the basis for several simple semi scale model boats. This is what the hull described here will look like when finished. It measures about 15 inches long by six wide. Being a planing hull the speed is high enough not to be boring, but not so fast it would easily get out of control. Due to it's size it is suitable for calm ponds, large fountains or pools. For safety reasons, don't run the boat in waters where prohibited or where people or pets are in the water. One word of caution; this project is not recommended for children or young adults without adult supervision. If you are not comfortable using the tools listed further down on this page, at the very least, ask someone for help. This, and any other project on this site, is undertaken at your own risk. The plans for this boat was developed to be easy and inexpensive to build. If you are interested in purchasing and downloading the plans, follow the link above. The material used is mostly balsa, fiber board, basswood etc. A crucial aspect for this project to be successful is that the weight is being kept down. I strongly recommend that you don't substitute the materials recommended here. Below is a list of material needed for this RC boat hull and approximate quantities. Material usage can vary widely from builder to builder. The quantity listed is fairly generous and account for some do-overs. 1/8 x 4 inch wide x 36 inch long balsa - 2 sheets minimum + 1 extra for superstructure. For those with access to metric sizes, substitute with 3 x 100 x 1000mm. 1/16 x 4 inch x 36 inch long balsa - 2 sheets. 1.5 x 100 x 1000mm. 1/8 x 3/8 x 36 inch long balsa strip (just one needed) - 3 x 10 x 1000mm for our metric friends. 1/8 X 1/4 x 36 inch long balsa strip or 3 x 6 x 1000mm. One should be enough, but won't allow for mistakes. Get a spare if you need reassurance. 1/16 x 3/16 basswood strip - one 36 or two 24 inch long - 1.5 x 5 x 1000mm. One is technically enough, but see note on material quality. 1/16 x 1/16 basswood strip - one 36 or two 24 inch long - 1.5 x 1.5 x 1000mm. Again, see material quality note below. I also used miscellaneous materials I have laying around, such as bamboo skewers, empty cereal boxes, scraps of basswood and plywood. For rudder and propeller shaft you will need stainless steel wire and some brass rod. More about this later. Generally, the balsa sheet should be relatively light-weight and soft, but most importantly, straight grain and even density. It doesn't need to be the "ultra light" stuff, but for this boat, avoid the heavy stuff. Also avoid warped or bowed sheets. 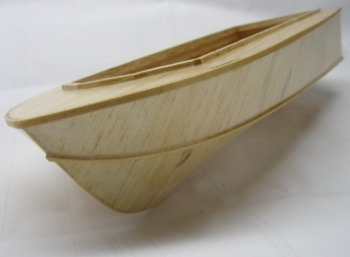 After a few boat projects you'll be a balsa expert. For the balsa strips I'd go for a harder quality than the sheets (if available). These strips will be used as structural stringers and for deck coaming, so there are no bends or anything to consider. These strips could be substituted for basswood or spruce if available in a pinch. I've had mixed luck with basswood strips. I order most of my wood online and thin basswood strips often has the grain run out the side of the strip causing it to split when bending. For that reason I recommend getting several spares if your ordering online. If you can pick them out yourself, you may be able to avoid the duds and thus buy less. Tools are often a matter of personal choice as there is often more ways than one to skin a cat. I've tried to list the tools I've used for each step in the building process. There isn't much available in the US for building small RC boats like this. For propeller I've come to use one plundered from a toy (I'll get into more detail later in the build log). For propeller shaft, stuffing tube, rudder etc. I opted to make them from scratch out of brass tubing and sheet. It's not hard to do if you've got some basic tools and the means and skill to solder with a basic solder iron. If not, there are commercial alternatives, but we'll get into that later as well. A single, relatively common, brushed Crest, Aristo-Craft or Mabuchi RE 280 can be used. The motor is driving a single shaft and prop through a piece of silicone fuel line tubing as a coupling - doesn't get any simpler than that. I got a low cost, light weight brushed speed controller from Hong Kong that I found on ebay. Make sure the ESC is with "brake OFF" and comes with reverse. The batteries are four AA NiMH in a cobbled up holder. There is no reason a more commercial RC battery pack couldn't be used. The propeller is "on loan" from a Tamiya Submarine Motor (#70153). This is a fairly common item and there are other brands and models. It's really not ideal as the entire unit is junked except the prop. However, propellers this size (3/4 inch diameter - about 20mm) are hard to come by in the US. In Europe I've found 30mm plastic propellers with M2 threads and corresponding propeller shafts. It is likely they would work quite well in this design. I'm in the process of researching this further, so stay tuned. RC Controls are my trusted Tactic TTX-404 with a Hitec HS-55 sub micro servo for steering. Hull Details - adding hatch coaming, skeg, rub and spray rails etc.